Human Collapse's debut is loaded with some gorgeous melodies and a very unique and suspenseful atmosphere that makes it seem fresh and interesting. 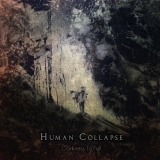 Human Collapse is a new band from Russia, featuring Andriy Tkachenko (who some of you may know as the vocalist of Ukrainian band Vin de Mia Trix). Their style can be described as Melodic Death/Doom Metal, much in the vein of bands like October Tide, Swallow the Sun, and Saturnus. It’s a style of Metal that has really become popular with Swedish and Finnish bands over the past fifteen or so years, most of them having been inspired by the early works of Amorphis and Katatonia. It will become noticeable to the listener early on that Human Collapse takes its influence from the latter. As a big fan of the depressive Swedish group, I think it’s safe to say that 'Darkness to Fall' is essentially what Katatonia would sound like, had they continued to play in the bleak and eerie style perpetuated in 'Brave Murder Day' and 'Sounds of Decay'. Although there have been a plethora of bands attempting to recreate this style (namely Rapture and Daylight Dies), I have to say it’s done effectively here. While the influences in atmosphere, riffing, and song structure are undeniable, Human Collapse still have their own twist on the sound, to a degree. As a whole, the album has a very soothing, ambient quality to it. All of the songs flow together, with atmospheric interludes of keyboards, clean guitars, and sounds of rain connecting each track between the heavy sections. The center of the attention here is, without a doubt, the lead guitars. With a very rich and vaguely oceanic tone, they create melodic, yet slightly dissonant, harmonies against the deep and crunchy rhythmic section. Cutting in through the flowing nature of the guitars are the anguished growls, which do their job well but don’t really leave much of an impression on me personally. There are some occasional spoken vocals, which sound gentle and poetic, much like the voice of Anders Jacobsson. At odd moments, the music will speed up to some oddly progressive leaps à la Opeth, but for the most part, the pace is fairly relaxed. A very nice touch is the occasional use of pianos and synths, which add to the mysterious and harrowing quality of the lead melodies, especially on final track 'Human Collapse'. This track is ultimately the stand out, in my opinion. Aside from packing in some impressively technical guitar and drumming lines into the closer, the song also begins with some very intense organs and wonderful clean vocals, which I really hope the band will experiment more with in future releases. As for the drumming, there is quite a bit going on, although they’re so buried in the mix that the hypnotic guitars easily dominate them. As a whole, the album has this peculiar and ethereal vibe that has a way of making me feel submerged or engulfed by its sinister tunes. It’s something that I imagine most funeral doom bands strive for, yet I can’t say many of them are capable of achieving such an effect on the listener. 'Darkness to Fall' is definitely an album that fans of Death/Doom and Melodic Death Metal should seek out. Although their style is recognizable and nothing new, it’s loaded with some gorgeous melodies and a very unique and suspenseful atmosphere that makes it seem fresh and interesting. Those who appreciate the classic albums 'Brave Murder Day' and 'Rain Without End' will love it. Visit the Human Collapse bandpage.